Students are back to school, and RiverChor will soon be back to singing! Wish to join us? Auditions will be Sunday, September 10th, from 1-3pm at Zion Lutheran Church in Clinton, IA. Auditions are walk-in, there is no need to prepare anything, and take about 10 minutes. Rehearsals will resume at 7pm September 11. Concerts this year will include our Fall Concert on Sunday, November 12, 2017, and we will again be the core group for Messiah (this year all of the Christmas portion performed with piano) on Sunday, December 17, 2017; both concerts will be at Zion Lutheran Church. We will perform a spring concert in March 2018, stay tuned for an exact date. The highlight of our season will be performing Haydn’s Creation with the Muscatine Civic Chorale….both in Clinton with Clinton Symphony Orchestra on April 28, 2018, AND with the Muscatine Symphony Orchestra on April 14, 2018. Soprano Alisa Magallon, tenor Alejandro Magallon, and bass Micheal Jorgensen are slated to be soloists. The soloists celebrate the first six days of creation as the archangels Gabriel, Uriel, and Rapheal; on the seventh day the soprano and bass become Eve and Adam, with tenor commentary. Both concerts will be under the direction of Brian Dollinger. RiverChor has been working hard this winter on a large variety of music. We invite you to enjoy it with us on Sunday, April 23, at 2pm in Zion Lutheran Church in Clinton, Iowa. The concert is free. Mark your calendar today and plan to join us on April 23rd! Keep your dates on Facebook? Here’s a link to the Facebook Event. Be part of an 80+ year tradition in Clinton! Come on out to St. John’s and sing a long with us. No experience needed, music is provided, and all ages are welcome. Don’t sing, but want to listen? You are welcome, too! Looking for a way to get in the Christmas spirit? Join us for an evening of music and carols! We’ll get on the Polar Express, dance with the Sugarplum Fairies, enjoy a Sleigh Ride, and learn to ‘Let It Go’. After intermission, RiverChor will join the Symphony to present the lighthearted Star Carol by John Rutter, followed by a Christmas on Broadway medley. The concert will conclude with several “Messiah” choruses, and a hearty carol sing-a-long. All students are admitted free, and the start time is a little earlier, so bring the whole family out to Vernon Cook Theater for a lovely evening on December 10th! 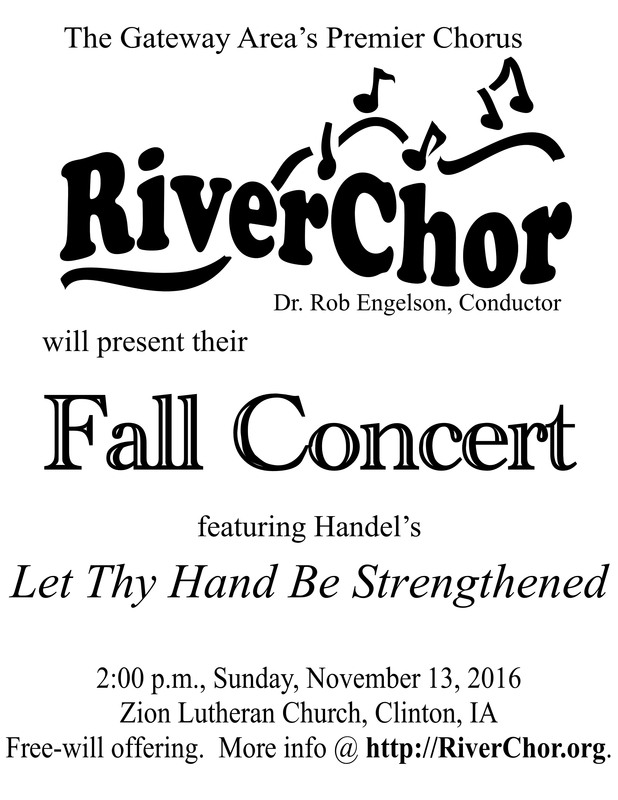 Mark your calendar now for Sunday, November 13th for an afternoon of great choral music! 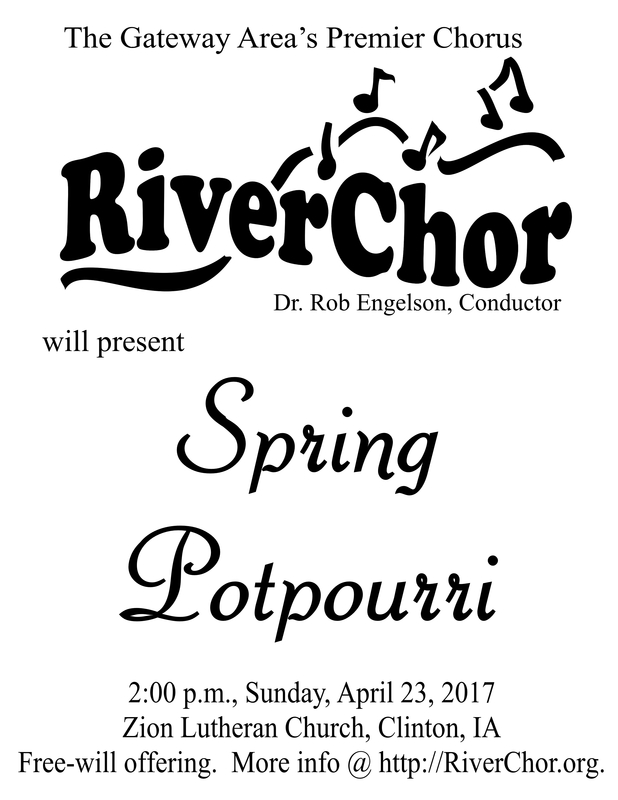 Are you interested in singing with RiverChor? We are having auditions on Sunday, September 11 from 1-3 pm at Zion Lutheran Church in Clinton, Iowa. You do not need to prepare anything, and auditions take about 10 minutes. RiverChor will present a blend of choral music taking you on a number of delightful journeys. Visit the Gypsies with Brahms, experience an ocean and a river community, relive your childhood with updated nursery rhymes, and Fly Away while Awakening to the music! The concert will be on May 1, 2016, at 2:00 pm, in Zion Lutheran Church in Clinton, Iowa. It is open to all, and is free. Mark your calendar for May 1, we’ll see you there! RiverChor is hard at work on our spring concert. I’ll post more about that soon, however I wanted to get this date change out to you. We had originally announced that the concert would be in April, however it will now be on Sunday, May 1, 2016, at Zion Lutheran Church in Clinton, Iowa. Mark your calendars now and save the date!! Did you miss our Messiah performance, or want to see/hear it again? Here it is! 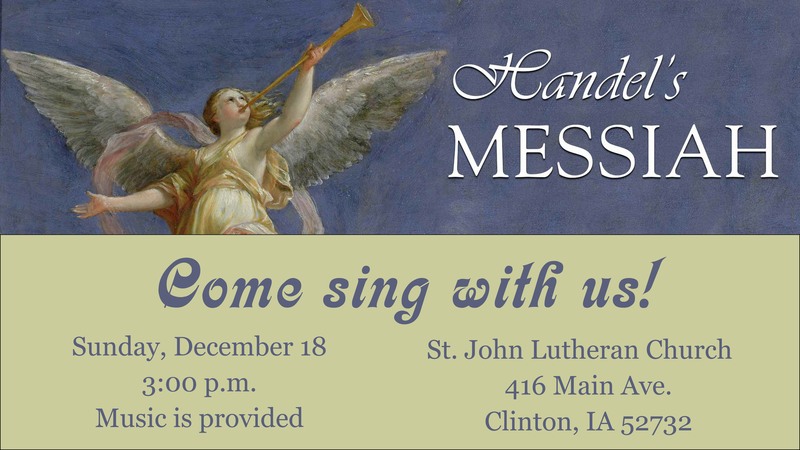 RiverChor, the Ashford University Choir, Clinton community singers, and Clinton orchestra members are in final preparations for Handel’s “Messiah”. 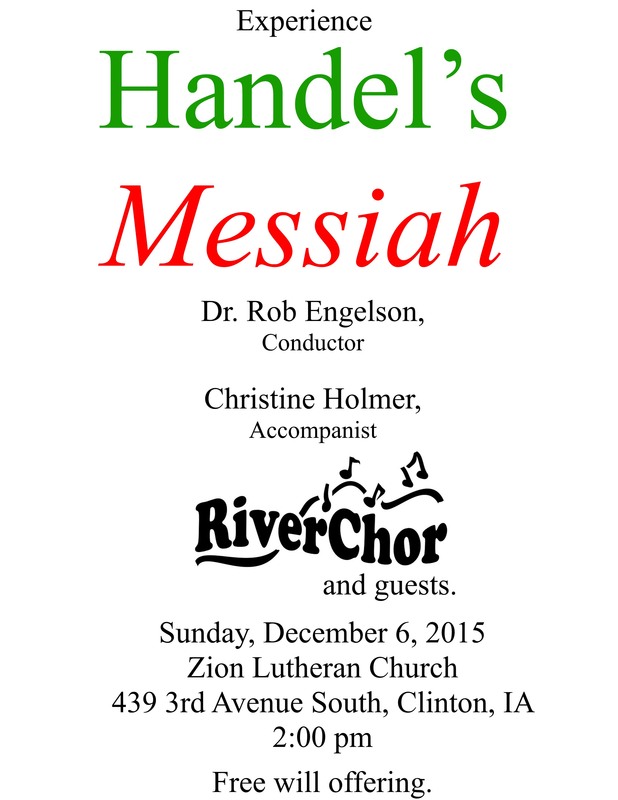 The performance is at 2:00 pm on Sunday, December 6, at Zion Lutheran Church in Clinton, Iowa. The performance is free, however offerings are appreciated to defray expenses. Please come out and be part of a Clinton tradition since the 1930’s! !